Well who would have thought it...a black edition 911 and reasonably priced! But this exclusivity is becoming a little boring I think! The current Porsche 911 isn’t dead yet – this is the run-out Black Edition special. Just 1911 examples will ever be built, and it’s loaded with extras to keep 911 sales ticking over until the all-new version is unveiled later this year. So what’s special about the Porsche 911 Black Edition? Unlike the Carrera GTS, which is the most focussed (and brilliant) 911 this side of a Porsche Motorsport product, the Black Edition is based on the entry level Carrera. That means a 3.6-litre flat six with 340bhp. But on top of that the Black Edition boasts non-metallic black paint (metallic Basalt Black is an option) and 19in 911 Turbo II forged alloys. And if you opt for a 911 Cabriolet, the fabric hood is black cloth. On the inside there is black ‘Black Edition’ lettering on the stainless steel kick plates, black leather, a SportDesign steering wheel, an upgraded Bose stereo system, sat-nav, cruise, rear parking sensors, rain-sensing wipers, and contrasting aluminium-look paint on the fascia trip, gear level and air vents. A badge on the glovebox also lets you know the production number of your car. What do all these extras cost you? 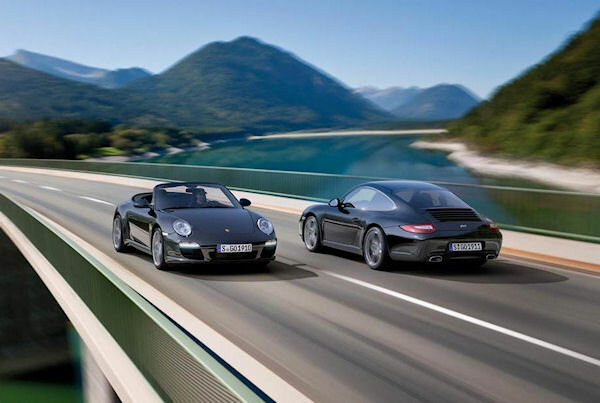 Nothing, as the £67,270 911 coupe and £74,958 Cabriolet cost exactly the same as the standard 911 Carrera and Cabriolet models. 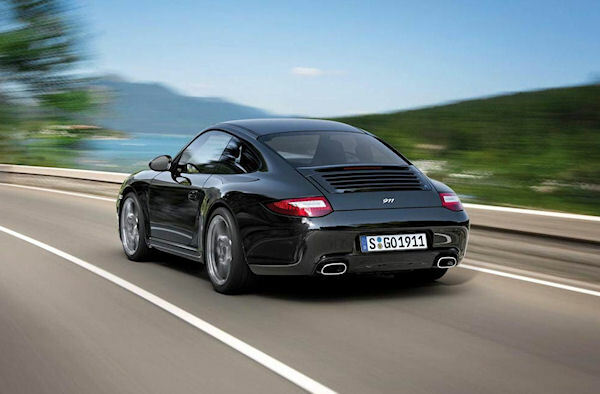 UK sales of the Porsche 911 Black Edition start in April 2011. I think these will sell but Porsche are over-doing the "limited edition exclusivity" ploy now! 997 Carrera S - Sports chrono plus - Basalt Black. Porsche are at pains to point out, you can add as much as you want from the regular options list. But joshing apart, the bog-standard Carrera is in many ways the very best 911. It’s the purest, and in many ways the most fun to drive. So why not grab the few extra toys on the 911 Black Edition? After all, they are effectively a freebie with the Black Edition costing the same as the Carrera. 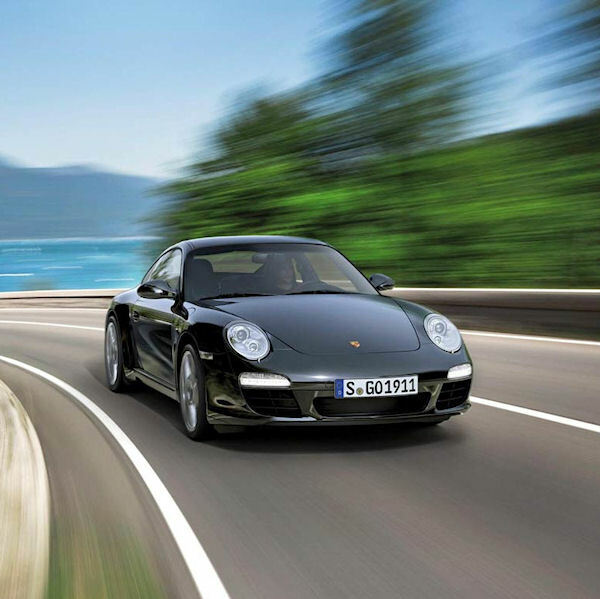 A new Porsche 911 Black Edition will go on sale in April 2011, with just 1,911 available across the world. This promises to be the final, gadget-packed, limited edition before a new 911 is introduced later this year. Based on the entry-level Carrera, the 911 Black Edition will feature the flat-six 3.6-litre engine delivering 345hp. In the coupe, this offers a 0-62mph sprint time of 4.9 seconds and extends to 5.1 seconds for the cabriolet model. These times can be further reduced by 0.2 seconds if Porsche’s double-clutch gearbox is added as an option. It also offers the benefit of increased fuel economy, pushing the official figure up towards 30mpg. The limited edition model will be available in coupe and cabriolet body styles and, as the name suggests, adds distinctive black highlights throughout. This includes a plain black paint job with the option of metallic paint. Cabriolet models receive an electric-folding hood trimmed with black cloth and black aluminium callipers to complement the 19” alloy wheels. Inside, the black theme continues on the leather upholstery and sports steering wheel. It is highlighted with aluminium effect on the air vents and gear lever. ‘Black Edition’ badges adorn the steel door entry guards and a small badge on the glove compartment confirms the limited number of models available. Porsche has upped the level of equipment in the special edition, most noticeably in the cabin, where a BOSE Surround Sound System comes with 13 loudspeakers and a subwiifer and central speaker. Satellite navigation, MP3 connectivity, rear park assist, cruise control and rain sensing wipers are all included in the package. If that isn’t enough, Porsche is offering extra option packs including a Sport Chrono Plus package comprising a launch control function to allow faster gearshifts and improved acceleration. 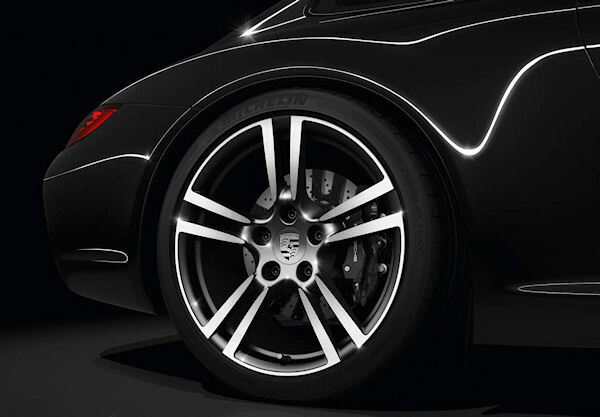 Porsche Active Suspension Management (PASM) and Porsche Ceramic Composite Brakes (PCCB) are available as extra options. 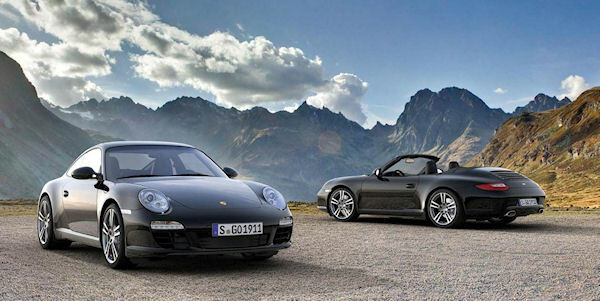 The Porsche 911 Black Edition will cost from £67,270 for the coupe and £74,958 for the cabriolet and both will be available to buy from April 2011. In spring 2011, the world of the 911 will become even more attractive. Porsche is offering an extremely attractive special edition based on the 345 hp (254 kW) Carrera with a 3.6 litre engine. The 911 Black Edition features a particularly comprehensive equipment package, available as a Coupé or Cabriolet – and only in black of course. Exclusivity and price make this 911 Carrera all the more attractive. The 911 Black Edition is limited to 1,911 units and costs exactly as much as the Carrera basic models: In Germany that is 85,538 Euros for the Coupé and 96,843 Euros for the Cabriolet, including value-added tax in both cases. The market launch gets underway in April 2011. The "Black Edition’s" black lettering on the stainless steel door entry guards provides a first hint of the high-quality interior design concentrating on purist sports car values. The interior continues the exterior colour scheme. Already equipped as standard with high-quality partial leather seats, the 911 Black Edition can of course be upgraded with the option of an additional leather interior. Also included in the series version is a sports design steering wheel. The instrument cluster naturally remains in black. On the glove compartment lid, a badge testifies to the 911 Black Edition's limited production run. Conversely, the decorative moulding on the dashboard, gear lever or selector and air vents provide a contrast with their aluminium look paint. The rear centre console is painted in the exterior colour. An acoustic highlight of the 911 Black Edition’s enhanced equipment is the BOSE® Surround Sound-System, fitted as standard. It was specially coordinated with the interior of the 911 Carrera models and comprises 13 loudspeakers (twelve in the Cabriolet) including active subwoofer and centre speaker as well as a seven channel digital amplifier with a total output of 385 W for a brilliant sound experience. 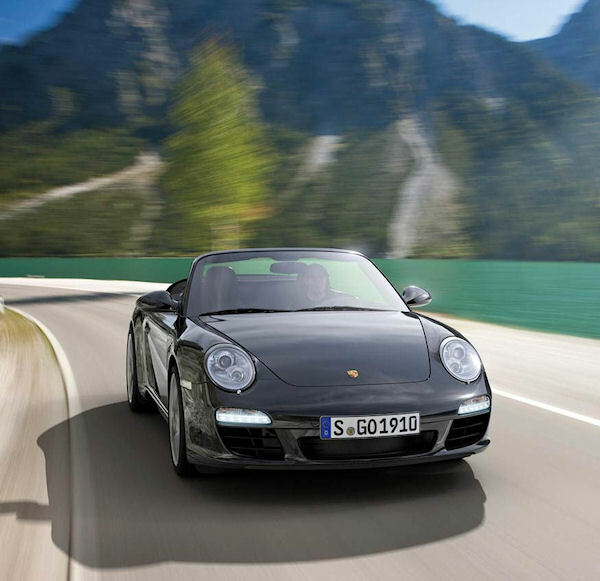 Coupé and Cabriolet are equipped with the Porsche Communication Management (PCM), as are 911 Carrera models. 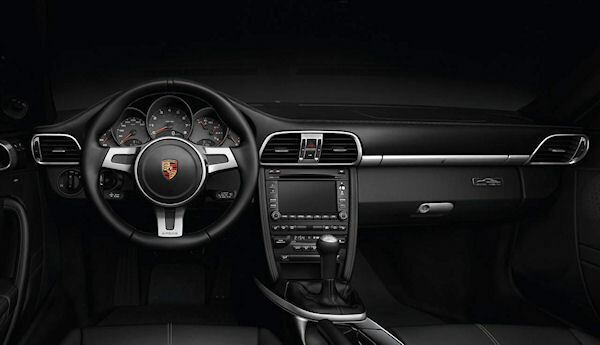 The GPS navigation module comes as standard in the 911 Black Edition as does the universal audio interface in the central console’s storage compartment. The 911 Black Edition's enhanced equipment package also includes parking assistant, cruise control, automatic anti-dazzle interior and exterior mirrors and a rain sensor. 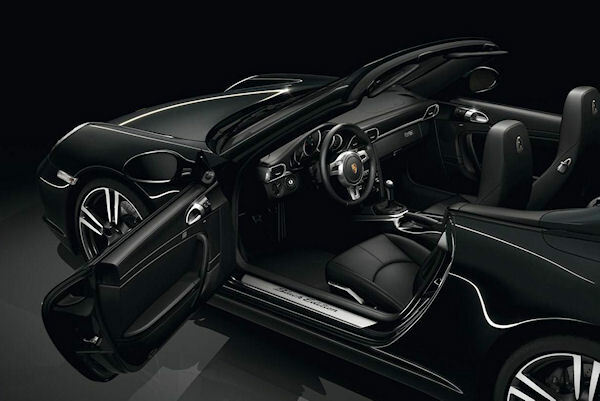 The 911 Black Edition enjoys all the same technical special equipment options that are offered for the Carrera models. First and foremost the Porsche-Doppelkupplungsgetriebe (PDK), that found its way into the worldwide sports car segment in the 911. The 911 Carreras with PDK turn in record performances thanks to their seven gears and quick gear changes with no interruption to the power flow. On the one hand fuel consumption: At 9.8 l/100 km (28.82 mpg imp.) and 9.9 l/100 km (28.53 mpg imp.) 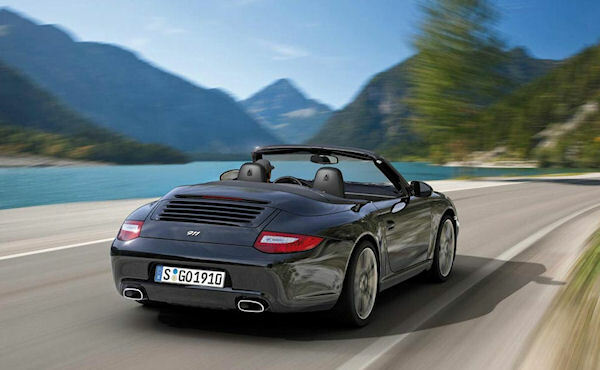 for the closed and open-top 911 respectively, the Carreras dip under the magical 10 litre limit. On the other hand dynamics: With PDK, the Coupé accomplishes the sprint in only 4.7 seconds, the Cabrio in 4.9 seconds. Responsiveness can also be further enhanced by the Sport Chrono Plus package, available as an option. It features the additional "Launch Control" function for the fastest possible acceleration from a standing start allied with a gearshift strategy for extremely sporty driving that enables very fast gearshifts. Launch Control shaves a further 0.2 seconds off the acceleration times of vehicles equipped with PDK. In 3 years time would you rather have a ltd edition 3.6 or a 3.8 S? Best wait until the new model arrives later this year. I'm waiting for the Platinum Silver with Black leather Special Edition. I think it's great, nothing wrong with Porsche putting out more 911 variations as far as I'm concerned. It might be a marketing exercise but it's a great way for them to shift some of the overlooked 3.6 Carreras. Not criticising - as someone involved in marketing, I applaud Porsche all the way and love everything they do and the way they do it. It's a great looking car (as always) and I'm sure will make 1911 people very happy, just like me. It's just not really much of anything other than a standard Carrera, but who cares!!! I think far from standard, looks great to me and very stealthy, well equiped and makes the basic (and some would say purest) Carrera a desirable beast. For those of us in the used market place, these can only be a worthwhile addition. Remember, he who pushes luck, pushes pram. Another run-out model, all manufacturers do it. Agreed, it's just a nicely spec'd Carrera and not in the same league as the Classic, or as focused as the GTS. I think it's a very nice way of getting the 3.6 Carrera some attention. It's a fantastic car and overlooked in favour of the 3.8 with its fancy S badge. I had a few hours driving a 3.6 at the Silverstone driving centre and it was everything you could want from a Porsche IMO. I'd seriously consider one of these when they're a year old and the 998 arrives, will be great value by then hopefully. I drove a standard Carerra too at Silverstone and it was superb. You have to to go some to notice a difference to the S during normal hard driving. As you say, when the 991 becomes available, these will be a steal. I don't have any issues with this one - just a bit of extra kit thrown in free for people who are ordering a base 911. Call it value. Also of course - the 3.6 is the one that royally sticks 2 fingers up at the silly emissions based tax rules (falling down into band K - below the punitive top two bands). Wizzard 993 wrote: ...this will depreciate fast(IMO). I think we have to appreciate that very few mainstream Porsches will hold their value after 3 years these days and these run out versions I think will be more desirable and as such retain better residuals. Willing to bet the 998 will lose value as quickly as the 997 does now from new. Hope so anyway as an 18 month to 2 year old 998 is on my radar. My take on the 911 Black Edition. If you specced a standard Carrera 2 to the same specification as the Black Edition it would cost over £6000 more. Porsche giving you £6000 of kit free sounds good to me.Although some of it I would not spec my car but happy to have it for free. Only issue is I am not convinced about black cars but I love the Turbo II alloys.